…to let you all know I’m not curled up in a corner hiding from the world 🙂 Things are ridiculously busy at work right now and terribly stressful at home with Mr. Husband’s job search, but I’m doing better. Counting down the days till I stop taking the evil birth control (13 more days!) and focusing on running. I went to my first group C25K training run on Sunday and while I’m shy and really didn’t talk to anyone, I did enjoy running with other folks. I think I might go to another group run tomorrow night and MAYBE I’ll actually talk to some ladies. Or maybe I’ll focus on the pounding of my sneakers on the pavement… either way, it will be good for me! In other news, recently I have been just obsessed with things for our cats. I think I’m filling a void… I made a mini beanbag for the cats this weekend using stuffing from some gross old pillows. The pattern was for a kid-sized bag, but you know, I don’t have any of those. What I do have is a surplus of cats! So they now have their own trendy cat-sized snuggly bag that is made of cute fabric to match my little house. unfortunately they have yet to accept it as a viable nap spot. In time…. 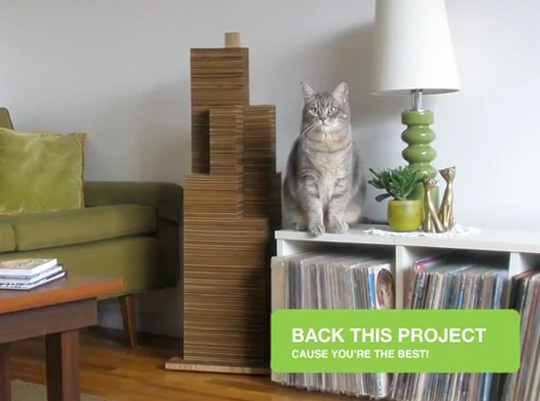 I also have discovered this site that is just filled with modern cat furniture and accessories. My creative juices are flowing as I work on finding ways to make two tall humans and four fat cats live comfortably in a tiny place in a big city as so many of the jobs Mr. Husband is applying for are in big cities with scary housing price tags. I know it can be done, it will just take some creativity. Before I go, I want to give a shout out to Tricia over at MotherNatureShmature. She is going through all kinds of crapola right now. If you have a few minutes you should stop by and show her some love. Your cats are damn lucky to have you as a mama! You are sounding much better! My dogs sure fill my need to mother void (at least partially). It’s adorable that you are getting crafty for your cats. Keep it up kitty mama! Cutie! Mine claw the chairs I personally sewed new covers for. It makes me sooooo angry! But then they look at me all cute and wide eyed and I just can’t help but laugh. They totally rule our house. I spoil my kitty to try and fill the void too. It works pretty well. Yea probably. Unfortunately my kitty hates babies. We are trying to get him used to them, but my mother is scared and says he is going to live with her again when we do have a baby. I’m sad about it, but I know he will be happy living either place. Thanks. Yea, we will see. My Mom is the one who is freaked out. Hopefully he will get used to it all.